Joseph Tehini & Fils is a privately owned electro-mechanical engineering firm, founded over a hundred years ago. It has become a leader on the Lebanese and Middle Eastern market during the past hundred years. Joseph Tehini & Fils designs, assembles, installs, and maintains some of the most reliable, cost-effective, and technologically advanced power plants and generating sets in the world. With branches in Lebanon and Qatar, exporting to Yemen, Iraq, and Africa, we provide power plants within a range of 30 to 100.000 kVA per generating set. We are one of the oldest MAN diesel engines agents in the world, since 1936. 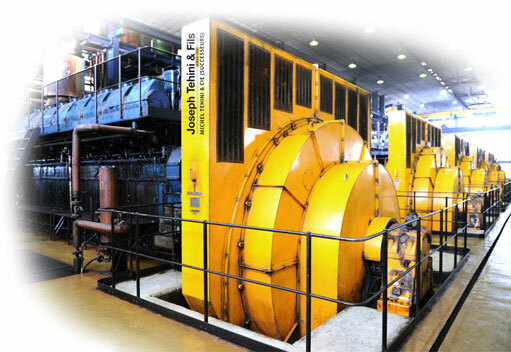 With over 750.000 kVA installed, Joseph Tehini & Fils accounts for more than 20% of Lebanon’s total power generation capacity. Among our customers is the biggest operational private power plant in Lebanon, at Holcim Chekka, with over 85.000 kVA installed. We represent and cooperate with MAN since 1936. Our manager, Mr. Sami Tehini is holder of an engineering degree from the University of BRAUNSCHWEIG, in Germany. Our 4.000 m2 factory is located 10 Km north from Beirut. You can visit our showroom on the Jal El Dib highway seaside, where a member of our sales team will be glad to assist you.